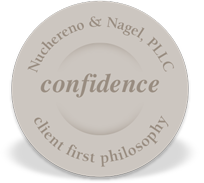 The attorneys and staff at Nuchereno & Nagel are dedicated legal professionals who believe personalized attention to clients is the hallmark of a successful law practice. With a heritage traced back over three (3) decades, our firm has been resolute in helping individuals, families and businesses who face difficult legal issues. Our law practice offers legal counsel in a variety of areas, including Personal Injury Claims, Divorce, Mediation, Alternative Dispute Resolution, Family Law, Wills, Trusts and Estates, Elder Law, Estate Litigation, Guardianships, Residential Real Estate transactions, Business and General Corporate, Civil Litigation, Personal Bankruptcies, Landlord/Tenant Matters, Criminal Defense and DWIs. Our clients come to us when they find themselves in need of advice and representation. We blend a wealth of experience with legal knowhow and are dedicated to fighting for our clients in and out of the courtroom. We fully understand the stress and turmoil that our clients often go through when confronted with daunting legal issues. While we make every effort to find practical solutions and avoid the expensive litigation, when necessary to protect your interests and meet your objectives, we are always prepared to go to trial.